QB. INTERACTIONS WITH THE WORLD OF FOOD Discussion on food: new food practices, sustainable processes and landscape valorisation. An evening presented by OFFICINA*, for the Environment week: "Naturalmente Trevignano". The event aims to popularize and raise public awareness on the issues of environmental and economic sustainability of processes, products and technologies related to the food production, from agriculture to the kitchen. During the event the number 07 of the magazine OFFICINA* will be presented: a bimonthly free online magazine that for the July-August number worked on the interaction between production processes and food. The event gives the opportunity to present some local and international experiences that have a role on the sustainable food procesees and energy for life, in accordance with the theme of Expo 2015. The key contents of the evening are the sustainable food processes, energy for life and feeding the world, safeguarding its resources. OFFICINA* N.07 has as main subject the food production processes involving sustainable and virtuous methods to safeguard the ecosystem. With the aim of promoting these themes, OFFICINA* has collected some contributions of local experiences, presented in the event, with the purpose of raising awareness about the possibility of creating energy, life and culture from this sort of bottom-up spontaneous processes. - Presentation of n.07 of OFFICINA* entitled "QB. Interaction with the world of food" The seventh issue of the magazine, bimonthly of Architecture and Technology, talks about food and sustainable processes associated with it. - La Terra dei Cachi Project, a synergic garden by the Association of social promotion GodegoLAB. This experience is demonstrative of the ability to create energy, feeding the planet just from a spontaneous solidarity. - The permaculture project of Federica Sgambaro and Denis Borso; it is a personal initiative launched after an experience in contact with an indigenous population of Mexico. - The project by the Association Green Utopia. The results of the first year of operation of the project will be presented in the evening. - The architect Anna Favaretto presents the workshop experience carried out in Madrid in 2015 on the theme of urban gardens in the Spanish city. The evening concludes with the delicious tasting offered by “L’orto del Castello” farm of Maria Rosa Venturato. 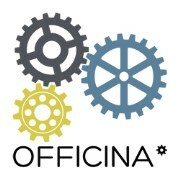 OFFICINA* is Cultural Association founded in 2015. It has as its primary intent to allow communication between the research world and the production one, in order to establish and promote a dialogue on issues related to architecture, innovation and building technology. The areas in which it operates are the environmental, economic and social sustainability, the local development and the technological innovation, with a focus on issues related to energy efficiency.